Jill Swenson: Congratulations on the forthcoming publication of your book, Leaning into Love: A Spiritual Journey through Grief, by Larson Publications in fall 2014. What is meant by the title of your book? Elaine Mansfield: After Vic’s death, I leaned into his love. I leaned into the love of the land, the life I created with him, our sons, close friends, and found support. Spiritual help came from meditation, various healing practices, and teachers, alive and dead. I lean my body and spirit into these teachings as I lean into the biggest trees in my forest. They protect me, hold me up, and heal me. After Vic died, we buried his ashes where he had requested in the woods. My sons and I built a cairn there. This had always been an important place for both of us—a massive healthy red oak at the top of a knoll in the woods and big trees all around. A group of basswood trees there was always my praying place. But a few months after Vic’s death, I began to visit daily, bring flowers and prayers and leave my grief there. The trees didn’t mind and I was soothed. Vic and I always loved nature, but since his death I find the forest is my healing sanctuary, more than ever before. I meditate, walk in the woods, and love combining spiritual practice with protecting the environment. Jill Swenson: Grief has its own calendar and seasons. How does your spiritual journey allow for those expansions and contractions of the sense of time when grieving? 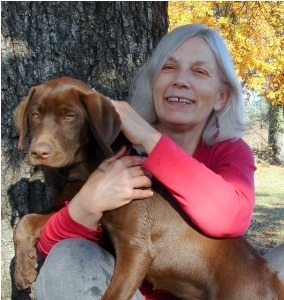 Elaine Mansfield: I write about each season and my meditation ritual includes the directions: a movement through the seasons of east in spring, south in summer, west in autumn, and north in winter. Eight days after Vic’s death, I dreamed I would live in the house of the Green Man for a year. I had heard of the Green Man but didn’t know who he was. I learned he was the pre-Christian nature god of death and rebirth, the one who presided over the cycle of the seasons. I understood that Nature and the cycles of Nature would heal me. So I focused on watching the details of where the sun sets on the horizon, when the buds swell, when the moss greens in the forest. It became a conscious practice, a healing practice, to feel myself and Vic’s death as part of the natural cycle of things. It made me feel less alone and more a child of the universe. Jill Swenson: You included some excerpts from poetry like the Sonnets to Orpheus in your manuscript. Why was it important to include these? 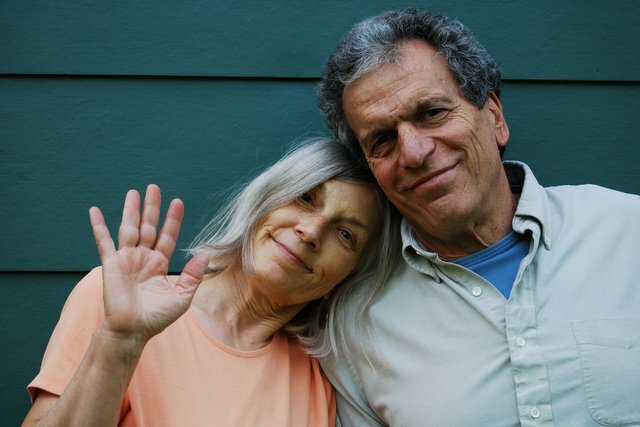 Elaine Mansfield: Vic and I loved and read poetry. He courted me, our first night together, by reading poetry. We loved many of the singing poets – Joni Mitchell, Leonard Cohen, Buffy St. Marie, and Bob Dylan. During Vic’s illness, we read more poetry. I often read aloud to him and friends sent poems. Many great poets touch the heart with the sacred. In my book, I recount how I read aloud the poem by Naomi Shihab Nye, “Kindness,” at Vic’s request during a medical procedure made more unpleasant by a grumpy mean-spirited doctor who terrified the resident and interns. I thought Vic was off his rocker when he asked me to read the poem in the middle of the procedure, but I read it anyway. It transformed an ugly situation into a healing sanctuary. The students relaxed, the doctor took in the message, and everything changed. When I asked Naomi’s permission to use her poem, I sent her this chapter and dared to ask if she might endorse my book. She gave me an enthusiastic yes. Jill Swenson: Poet Naomi Shihab Nye describes your book as magnificent and profound; offering encouragement and solace. It has been a long road from writing notes in your journals to publishing a book. Elaine Mansfield: During Vic’s illness, I kept detailed journals of what was happening. I didn’t want to forget, and I knew he or I might because sometimes so much happened at once. When I felt exhausted and at wit’s end, I ranted in writing. It didn’t make my fear disappear, but it made it conscious, and then I could speak to my fear and soothe myself a little. Jill Swenson: So writing began before you had any notions of publishing. Writing has therapeutic effects. When do you take it to the next stage? Elaine Mansfield: I began to write within months after Vic’s death. I went to one writing class, but was embarrassed to sob as I read my pieces there. Then I found a smaller writing group called “Writing through the Rough Spots” with Ellen Schmidt. There I could write my stories and cry. I let it all pour out and went back to my journals for details. After two years of writing stories, Ellen told me she thought I had a book. But it was more like a series of short stories. I filled in the spaces as best I could. My cousin who is a published author told me I needed to learn how to write a book proposal. The next day, I saw an announcement for a workshop by Jill Swenson of Swenson Book Development LLC on how to write a Non-Fiction Book Proposal at Buffalo Street Books in Ithaca. Jill Swenson: I recall that workshop and meeting you there. Elaine Mansfield: You read the rough draft of my manuscript and kindly let me know all the problems with it—and there were many. Many of the short stories were powerful, but they didn’t make a whole narrative. So you read it, made editorial recommendations, and advised me to have others read it, too. From all the feedback, I rewrote and began the book in a new place. I omitted much and added more. Then I had more readers and more feedback and reworked it again in a writing group. This book was rewritten 100 times, but it finally feels finished. I’m grateful to you, Jill, for believing in me and my story and for Paul Cash of Larson Publications for giving me clear editorial direction from the beginning. Jill Swenson: So the book manuscript is finished, and yet you still continue to write. Where do you write now? Elaine Mansfield: I usually write at my computer, in the office that was once Vic’s. It’s quiet and there are windows on the east, south, and west, so I feel in touch with nature even though I’m inside. I take writing classes and find this keeps new ideas flowing. I carry small notebooks with me and sometimes have ideas on walks or in the middle of the night or while driving (and pull over to the side of the road to write them down). I usually do serious focused writing in the afternoon. I spend mornings with the business of publishing a book, building an audience, and reading other people’s blogs and articles. I devote most afternoons to writing. I try to write a blog or do something for my book every day—and still have a life of political activism, caring for friends, socializing, and caring for my body. It’s a constant balancing act. Jill Swenson. Balance. Breathe. Wise words for writers. Literary Representation, Memoir bereavement, Elaine Mansfield, Larson Publications, Leaning Into Love, Spiritual Journey Through Grief. Permalink. Lovely interview – thank you Jill and Elaine. Elaine, I look forward to reading your book! Cheers from a fellow member of the club no-one wants to join. Thank you Carolyn Barnabo for stopping by and reading the interview with Elaine Mansfield about her forthcoming memoir, Leaning Into Love. Larson Publications will release the book later this year. Please stop by ElaineMansfield.com and subscribe to Elaine’s blog, if you haven’t already.